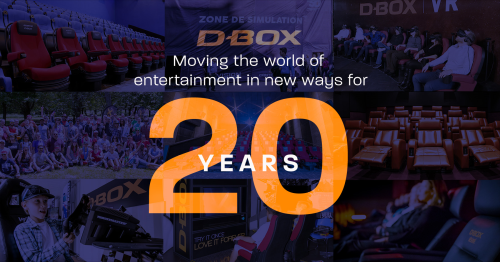 D-BOX Technologies Inc. (TSX:DBO), a world leader in immersive entertainment experiences is proud to celebrate its 20th anniversary this year, capping a remarkable string of successes for the company all over the world. D-BOX started in 1998 with the release of their high-end home theatre system built by a team of motion designers and engineers. The remarkable success and widespread interest, propelled the intrepid team of maestros to remaster their patented motion technology for movie theatres. In no time, it quickly became the blueprint for a success story that has reached the four corners of the world. Once a pioneer and now a true leader, D-BOX has solidified its presence on 670 screens in 40 countries becoming the go-to choice for discerning movie-goers of all ages seeking unforgettable and unique entertainment experiences. Over the years, D-BOX has built strong relationships with a long list of major Hollywood studios. Since 2009, more than 250 films have been motion coded with D-BOX technology, including recent blockbusters such as Star Wars, Fast and Furious, and Black Panther. A large part of the company’s popularity with exhibitors can be attributed to the reliability, modularity and easy installation of the seats in virtually any type of auditorium setting. What’s more, the guaranteed increase in concession stand sales combined with the boost in box office revenue have made D-BOX a highly profitable addition to every venue. In the past year alone, the company recorded a 24% increase in tickets sales at large and small theatres across Canada, the United States, South America, Asia and more. The recent upsurge in moviegoers searching for an evening of premium entertainment has also pushed demand for their recliner motion seats upwards by more than 175%. The movie industry isn’t the only sector in which the technology has excelled over the years. The company recently launched the very first D-BOX VR experience at the Cineplex Scotiabank theatres in Ottawa in 2017 to great fanfare. In fact, D-BOX has been gaining widespread popularity amongst VR developers who are utilizing the motion technology to deliver a more realistic experience and help curb the motion dizziness often associated with virtual reality. One example of this incredible effect can be found in the NFL Times Square Experience created in collaboration with Cirque du Soleil. This permanent attraction features 188 motion seats meticulously synced with NFL Films exclusive content to give sports fans an unbelievably real feel for what it’s like to be a player in the game. In addition to their 20 year anniversary, D-BOX is also celebrating another milestone: a 15-year strategic partnership with industry leading corporation, Triotech. The Canadian company specializes in multi-sensory interactive attractions that are amazing audiences all over the world. For their most recent collaboration, D-BOX is proud to have played a role in the development of The Flyer – San Francisco, the world’s first 3D flying theatre at Pier 39. The attraction recreates an unforgettable flying experience that literally has audiences on the edge of their motion seats. Not surprisingly, The Flyer was named one of the 12 most anticipated theme park rides of the year according to USA today. On the international stage, D-BOX worked with CL Corporation, an innovative company specializing in producing interactive and immersive entertainment concepts for amusement parks and more. This collaboration is just one example of the incredible flexibility and range of possibilities that D-BOX motion technology can offer. CL Corporation integrated D-BOX motion technology into 130 seats in the biggest 4D dome theatre in the world at the Shinhwa theme Park in South Korea. More recently, D-BOX had the opportunity to utilize their motion system technology in 128 seats at the Antibes Marineland 4D cinema, latest project delivered by CL Corporation. With so many successes, it’s not surprising that the future holds so much promise for D-BOX and its unique motion technology. Moving forward, the company is focused on building new partnerships, developing exciting, unique projects and creating more ways to enhance the way people experience entertainment.